George Clooney is one of the most successful actors turned director. I mean that from a quality standpoint(although we all know he has some decent box office clout). He still manages to turn in exciting and challenging roles year after year, and at the same time continue to work on his own films about once every couple of years. Good Night, and Good Luck, showed that he could handle some serious drama and keep a film concise and powerful with a minimalist approach. With The Ides of March, Clooney shows just how much range he has as a director, venturing into Political thriller territory and never taking the Grisham way out of murder and lawyer assassins. 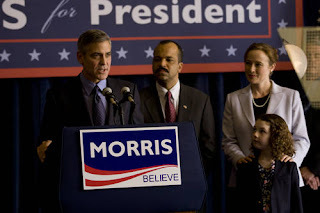 This is another taut film about a fresh new candidate for president and the machinations behind his campaign and those of his rival. We see all the back dealings and promises and cover ups, and the effect it has on our hero Ryan Gosling as an idealist who tries to keep up with the tumultuous and unforgiving world of politics around him. I mentioned in my review of The Student that it was hard to care about anything since we never understood what the characters stood for, other than someone promising a position to someone else. Now, here there is plenty of lobbying for cabinet positions and hustling for votes, but Clooney gives us a broad idea of what each candidate represents. Morris is a new kind of politician dedicated to new energy sources, and promising a change. He is obviously very liberal and solid in his beliefs, not willing to change his stance even if it means garnering more votes and support. By doing this and setting up his opponent as a much more conservative Democrat, we have an idea of why Gosling is so passionate and why the other guy winning would be bad for the country. It gives us reason to care and invest ourselves in the story. 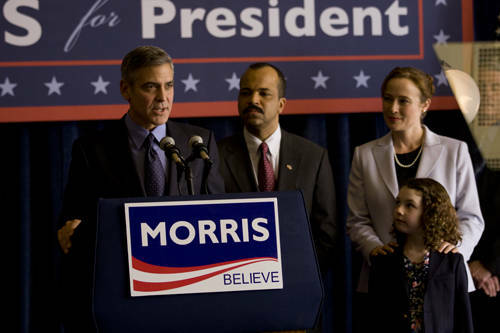 Clooney is great as Morris, someone who has already played the political game and is on his way to the highest possible position. He no longer has to dive in the trenches to get results, his campaign staff do that for him. 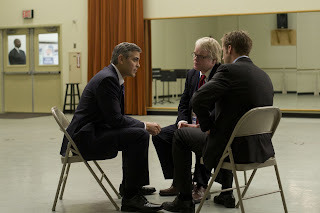 As the film progresses and events occur that cause him to rethink his political stance, Clooney plays the reluctance across his face wonderfully. 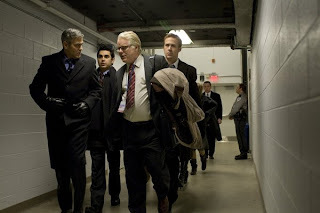 It's a small role but Clooney makes every moment count. Gosling turns in another strong performance as the ambitious aid to Hoffman's campaign manager. His arc starts at the height of idealism and diminishes slowly as the film progresses. A great turn in an amazing year for the young actor, I still think his strongest performance was in Drive. Hoffman and Giammati turn in the strongest performances as dueling campaign managers who have both in the game for a long time. If any awards consideration for acting are to be had it will be for these two. They are both such great character actors to see them here dueling for the spotlight is a real treat. It'd be hard to choose a favorite since they are equally amazing in their roles, although Id say Hoffman edges out Giammati slightly, especially the scene where Gosling comes clean about meeting with Giammati. 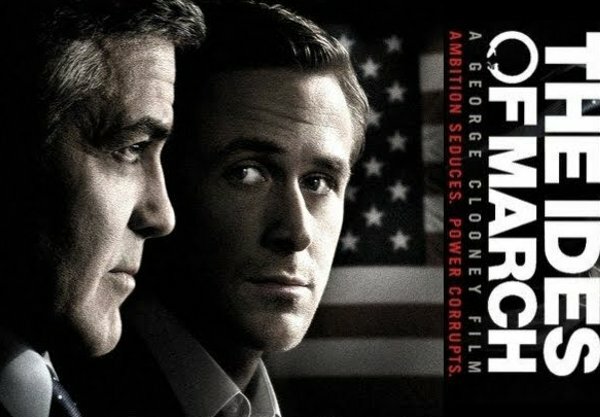 This is a well made political thriller with a bit of Sweet Smell of Success thrown in and further proof that Clooney will have a future as both an actor and a director. He knows how to keep his films tight and concise, and uses subtle composition to make some strong visual impacts. 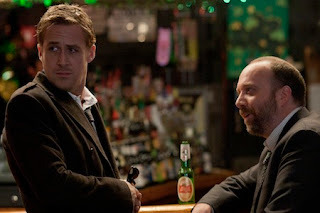 I love the first and last scenes, you could just show those two to someone and they could probably get the results of the film, thanks to some fine acting by Gosling. This has been garnering some oscar buzz, which although it's a good film I doubt it would be in my top ten, but hey the Academy is it's own beast. Well done Mr. Clooney. One last thought - Jeffrey Wright is such an amazing actor, the guy kills it in every film, whether he has a strong role like in Source Code, or he has ten minutes of screen time like here. Hope he is in the new Mendes James Bond film.